I read a lot of web pages and watch a lot of YouTube by people claiming to have a tar free gasifier. Hmmmm?!?! That is an interesting concept to me. What happens when that nice tar free gasifier is turned off with a 2200F core and raw wood close by? There will not be any air flow to burn the tars and any water in the wood will boil, pushing tar gas out of every unsealed opening. That includes the restriction. Once tar is in the gas cleaning system it will stay there until it sees metal cold enough for the tars to condense. When the unit is run again the heat will revaporizes the tars and the tars will move downstream until they see metal cold enough to condense again. I know…some people will hate that I am revealing this and ruining some perfectly good marketing hype. This is Victoria’s preheat shell. Even though it gets hot enough to make the tars smolder, it is still quite dirty from shut down tar gas. That is not to say that she doesn’t start and run cleanly, because she does. 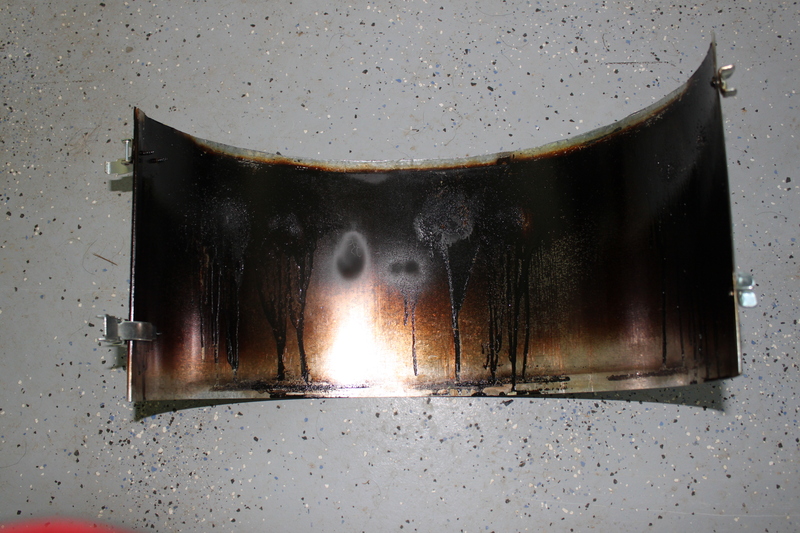 However, shutdown tars WILL show up in the system requiring periodic heat exchanger cleaning. That is why the Gas Station looks like a laboratory pilot line. Cleaning the Gas Station’s primary heat exchanger is simply a matter of unscrewing one pipe plug, rodding the pipe, reinstalling the plug, and cleaning out the debris sump. Remember, COLD is your best defense against tar after the gasifier. You will see it, even with a perfect gasifier. The other time a “perfect” gasifier will make tar is if you start it with raw wood and do not fill the hearth with charcoal over the nozzles. There is NO way this situation will not make tar. Simply by the nature of how gasifiers work, the combustion must end before the flames go all the way through the fuel bed. If the end of the fuel bed is not ALL perfectly off gassed charcoal, the system WILL make tar. The Gas Station is no exception.